Not the Tommy Lee you'd think of, obviously. 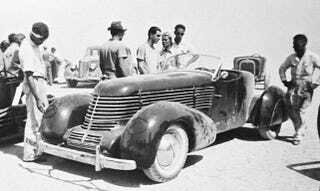 Body and chassis of this '36 salt-flats racer were Ford derived, fenders (detachable) were Cord. Engine was an Offenhauser. Video and more pics linked here.